Darcy Stefano is seventeen, going on forty, according to her father. She swiped her mother’s credit card and went to Paris. The Stefanos have more money than sense and they pay Jeri to head for the City of Lights and retrieve their errant daughter. 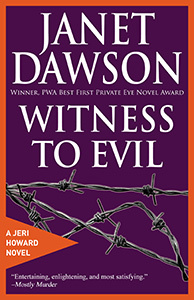 But Darcy and Jeri come face-to-face with long-ago evil and its modern-day counterpart in Witness To Evil. I admit that, quite readily. I could use the money. The Stefanos were willing to part with it. In fact, they had more money than they had sense. They also had a problem. When I was working as a paralegal, before I’d been recruited to join the Errol Seville Agency as an investigator, one of my colleagues told me that people who go to lawyers are sick and want to be healed. People go to private investigators for similar reasons. We get hired to solve other people’s problems, the ones they can’t—or won’t—solve themselves. Dan Stefano phoned me on a Monday morning in late April. After hearing him out, I agreed to meet him and his wife Elaine that afternoon, at The House. The ostentatious edifice the Stefanos were building was located just off Sea View Parkway, on what the developers call Harbor Bay Isle and what I call Bay Farm Island. It’s a section of Alameda that used to be marshland and is now landfill, located north of the Oakland airport. Once it really was an island, where farmers grew produce, at the end of a causeway that became Island Drive. Now developers grow condos and huge houses that crowd small lots. A good many of them are stucco palaces that look as though they belong in Miami Beach, not the Alameda I grew up in, with its stately Victorians, wood-framed and decorated with gingerbread trim. When I first saw the place Monday afternoon, all I could think of was the Winchester Mystery House down in San Jose, the project that just kept getting bigger and bigger. Sarah Winchester, heir to the Winchester arms fortune, gave new meaning to the term eccentric. Haunted by evil spirits known only to her, she designed a house built to outwit them and spent thirty-eight years remodeling. The place had a hundred-sixty rooms, thirteen of them bathrooms. There were two thousand doors, ten thousand windows, and forty-seven fireplaces, as well as secret passageways and doors and staircases that led nowhere. The place was such a rabbit warren Sarah and her servants needed maps to find their way around. Elaine Stefano wasn’t aiming for a hundred sixty rooms, but the structure that rose from the shoreline lot resembled an office building rather than a home. It was three stories high, blocking the view of the house behind it. Terracotta-colored stucco and a brown tile roof contributed to a vaguely Spanish-Italian-Mediterranean look. A three-car garage with a short driveway presented its face to Sea View Parkway. I parked my Toyota here, alongside a contractor’s truck and a late-model Mercedes. Then I followed a path that led around to the left, where a few steps led up to a porch and the double front doors, one of them ajar. As I stepped into a spacious foyer, I heard the whine of a power saw coming from somewhere above me, accompanied by a radio playing country music. Several voices conversed in Spanish. A wide uncarpeted staircase curved up to my right, while ahead of me I saw an open airy space that looked as though it was going to be a enormous kitchen when it grew up. On my immediate left was an area probably intended as a formal dining room, but as yet there was no table beneath the spiky modern chandelier. Beyond this, a foot lower and anchored by a massive stone fireplace, was a living room, also uncarpeted. It was bigger than my one-bedroom apartment over in the Adams Point section of Oakland. I walked slowly toward a wall of glass, windows and a sliding door looking out onto the bay, with a sweeping view of the Bay Bridge and San Francisco beyond. The water reflected the glare of the afternoon sun. I turned from the bay and looked back the way I’d come, seeing several paint cans arrayed against the dining room wall. Carpet samples and books of fabric swatches were piled in the corner. The huge kitchen featured lots of blinding white tile and bleached pine cabinets, with a rectangular work island in the middle. There was a big gap on one wall, next to the window over the white porcelain sink, where the refrigerator would go. On the counter between this and the sink, someone had set up a white Braun coffeemaker, its carafe half-full of strong black coffee, and, next to it, a motley collection of plastic mugs. I was alone, save for the workers upstairs. Then a woman with straight shoulder-length brown hair came through the sliding glass door that led from the living room to the small rectangle of dirt that was the yard, fronting on the Shoreline Trail. She wore loose-fitting blue slacks with a matching jacket over an ivory blouse, and sandals with low heels. A slim leather shoulder bag completed this ensemble. A couple of runners jogged by on the trail, followed by a cyclist and an elderly woman walking a frisky golden retriever. The woman with the phone listened impatiently to the other person’s half of the conversation. She walked into the kitchen, poured some coffee into a mug, then swallowed a mouthful. Then she started talking again. Her abrupt tone made me guess she’d cut off the other voice. I didn’t think she’d seen me. Certainly she hadn’t acknowledged my presence. He nodded distractedly as he shook my hand, his brown eyes on the woman I assumed was his wife Elaine. I’m five-eight, and he was perhaps an inch taller, with an incipient paunch rounding his stomach and a computer-nerd slouch. He was losing what used to be a head of curly black hair. When he’d called me earlier, Dan Stefano had told me he was in the computer game business. I’d checked him out. He was being modest. He’d started StefanoWorks two years ago and was considered a hot entrepreneur in a highly competitive business. He and his small staff of employees created innovative interactive CD-ROM games in a suite of offices located not far from here at the Harbor Bay business park. His most recent release had won a prize and was selling like the proverbial hotcakes. StefanoWorks was worth serious big bucks. I’d checked out Elaine Stefano as well. She was a real estate agent at a big firm in Alameda. When she wasn’t selling houses, I guessed she supervised construction of The House. Then she looked at me as though seeing me for the first time. She put on her company face. It smoothed the scowl that drew lines between her eyebrows and at the corners of her hazel eyes. Her full mouth segued from a frown to a polite and business-like smile. She was taller than Dan, with sleek athletic curves that made me speculate she was into jogging or aerobics when she wasn’t terrorizing decorators. “Call me Dan,” he said. “I’d offer you a seat, but…” He shrugged and looked at the disarray around him.